Ah, Halloween. That magical time of year when formerly bold infants and adventurous toddlers are saddled with enough emotional baggage to last them the rest of their childhoods. That wonderful night when kids are encouraged — no, socially obligated — to walk up to strangers' doors and ask for candy. That festival of spirits when every piece of "festive" decor becomes fodder for nightmares and the sight of parents in push-up bras and zombie makeup gives children enough Freudian unease to last through at least $20,000 worth of therapy sessions. On Halloween, children don't just get to watch uncomfortably while Dad leers at “high school cheerleaders” who look at least 45 and Mom paints her face to look like a grinning Day of the Dead skull despite the fact that she doesn't even know what the holiday means — kids get to wear their own terrifying costumes, too! The luckiest children get to be adorable lambs and cuddly teddy bears and harmless vegetables, like carrots, but what happens when parents lose all perspective and dress their children as flesh-eating diseases, offensive cultural archetypes, or things that go bump in the night? A lifetime of psychological scarring and a terrible sugar high, that's what. 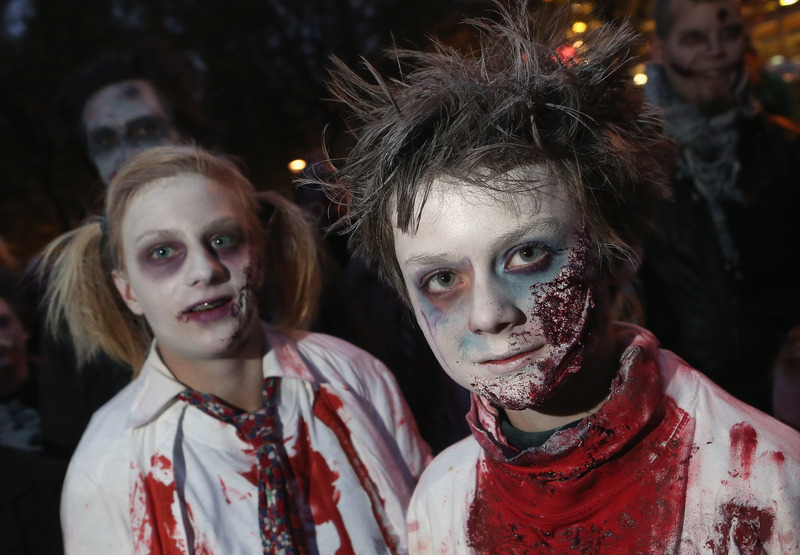 Here are 10 ways that you can traumatize your child on Halloween, no social mores required! When adults see a miniature cannibal or a tiny version of Freddy Krueger toddling down the sidewalk and begging for Reeses Pieces, they ooh and aah, because they know the little thing can't hurt them. But imagine being a child whose face has been smeared with fake blood without her knowledge and who's wearing a shirt with a bloody alien exploding through it. You assume you're dressed as a cow or a tomato, like the rest of your toddler friends, when suddenly you look into the nearest reflective surface and HELP, MOM! NIGHTMARES ARE REAL! YOU'RE GOING TO DIE! The unidentifiable “animal” costume is a lazy parent's best friend. Slap a pair of ears — whose ears? — and a tail — what kind of a tail? — on your child, and the little tyke is officially a beast of the field or a bird of the air. Is she a bear? A cat? A monkey? She doesn't know, and you're not telling her. There are better ways of teaching your child that not everyone in the world looks exactly like you in your 1979 class photo. On an intellectual level, it's pretty cool that you constructed an entire Leaning Tower of Pisa costume for your child using nothing but papier-mâché On a practical level, your child can't fit through doors, sit down, or use the bathroom, and his angry tears show no signs of stopping. You may pride yourself on your “edgy” sense of humor and your willingness to “just, like, go there,” but don't take out your tasteless love of controversy onto your innocent babe. If Prince Harry couldn't pull of a Hitler costume, neither can your kid. And do we really need to discuss why “fetus” just isn't going to work? Sure, your little princess asked to be a “sparkle sparkle twinkle fairy” for Halloween, but is elaborate electric wiring really the best way to make her light-up dreams come true? Any children's costume that involves fake chest hair, fake cleavage, or fake belly button rings is an automatic no. You may be craving the Instagram likes, but is it worth the inevitable call to Child Protective Services from a “concerned neighbor”? Yes, your child really wants to be the cute talking snowman from that blockbuster Disney movie, but think of the grandchildren. Think of the great-grandchildren. Think of how much trouble it will be to explain to your children's children that in 2014, everyone was still singing “Let It Go,” and all we talked about was the rumors of a Beyoncé and Jay Z divorce, and we were obsessed with trending Twitter hashtags, and that's why the world is now a huge smoking pit of rubble and Mommy and Daddy have weird growths on their arms and legs because of a little thing Grandpa calls "nuclear fallout." Sounds like a real headache, huh?